Shortly after opening Ramsey’s on High Street in 1989, Rob Ramsey was faced with the fortunate problem of being so busy that the ovens in his tiny kitchen were running 24 hours a day cooking meatloaf, pot roast and other menu items, allowing no time to cook the two pies (Chocolate Brownie and Peanut Butter) on the menu. A small space became available next door to the restaurant and Ramsey set out to help his lead prep cook, Missy, start a new business, selling pies to Ramsey’s Diner and a local grocery chain. The next day, Ramsey came to work to find a note from Missy saying that she had a change of heart and had decided to move to Connecticut to marry Brad after all!! Ramsey was now in the pie business, and never heard from Missy again. The business and menu has grown considerably since those early days and is well known in Lexington as the home of the homemade pies. Missy’s has won the Lexington July 4th Pie Contest (professional division) in 2005, 2007, 2008, and 2009. In 2010, Lexington discontinued the professional category. 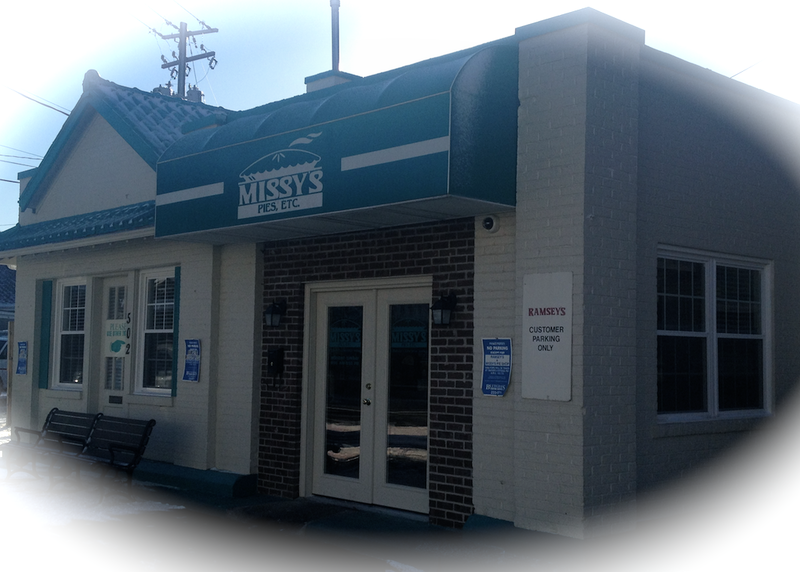 October 2014, Missy’s moved directly across the street to a newly remodeled, yet historic building. This move allowed more space for its ever increasing business, and also allowed for the creation of a small, “eat-in” area for those who wanted their pie and coffee right now! The addition of seating makes Missy’s Pie Shop more than a carryout bakery, and we now offer soups and sandwiches, as well as pie and coffee. We have a light lunch menu. Missys sells several of Ramsey’s most popular items in bulk (Quarts). These items include Ramsey’s chicken salad, chicken and dumplings, veggie soup and some of homemade salad dressings. Please see other non pie menu. Missy’s is also committed to community involvement. We work with the local schools in our area as well as the Universities. Missy’s is also involved with several charitable organizations, The Make A Wish Foundation, The Arts Full Of Fun, The Habitat For Humanity and the Kentucky Colonels, just to name a few.